Dysphagia is defined as a swallowing disorder characterized by difficulty in the oral preparation of the bolus or moving of food from the mouth to the stomach. Dysphagia symptoms may include coughing after swallowing, choking on food or liquids, the feeling of food stuck in the throat, painful swallowing, difficulty breathing when eating and the occurrence of aspiration pneumonia. Dysphagia as a symptom may have a functional (usually neurogenic) or mechanical origin and can also be secondary to iatrogenic factors such as tracheostomy cannulas or certain drugs. Logically, neurogenic dysphagia will refer to the swallowing disorder that appears in the context of an injury to the nervous system. What is electrostimulation: the VitalStim® Therapy system? 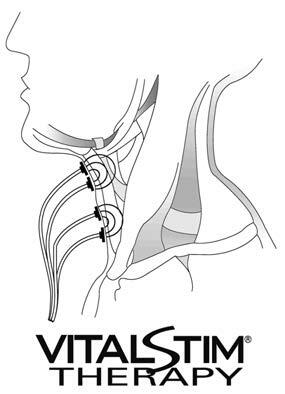 The VitalStim® System is a painless non-invasive therapy for treating dysphagia, obtained by external electrical stimulation which is applied to the front of the neck (defined as such in the market by the Food and Drug Administration in 2002). VitalStim® Therapy is backed by multiple clinical studies. The VitalStim® Therapy System is the only technology approved by the FDA for restoring swallowing function in patients with oropharyngeal dysphagia. 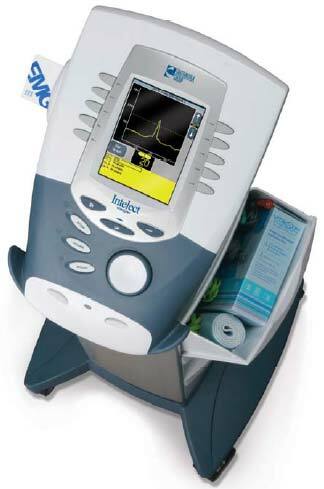 The VitalStim® Therapy System uses small electrical currents to stimulate the muscles responsible for swallowing. At the same time, trained specialists (Rehabilitation doctors and speech therapists) help patients to re-educate their muscles through rehabilitation therapy. · Safer and more effective handling for patients. · Acceleration in the recovery time from a restricted diet. · It helps patients achieve sustained improvement and long-term results. The lasting effect of VitalStim was validated in a three-year study submitted to the FDA, which showed the improvement in swallowing function was maintained throughout this time. Another published study showed the positive and lasting impact of VitalStim in a group of dysphagia patients in which previous attempts at treatment with conventional therapy had failed. How does the VitalStim® Therapy System work? The VitalStim® Therapy System is based on neuro-muscular electrical stimulation (NMES) where a small electric current, carefully calibrated, is emitted by electrodes designed specifically for this purpose. The current stimulates motor nerves and these in turn cause the contraction of the muscles involved in the complex mechanism of swallowing. The quality in the function of improved swallowing with repeated therapy, muscles are retrained. 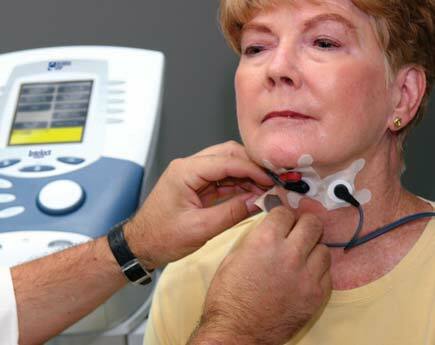 The VitalStim® Therapy System involves the administration of small electrical pulses to the neck muscles involved in swallowing through special electrodes attached to the skin overlying said musculature. · The doctor or speech therapist expert determines, by prior assessment, the muscle groups to be treated. · They place the electrodes adequately on the patient and start the application of current with gradual increases in intensity until a satisfactory level of muscle contraction is achieved. · They perform exercises, manoeuvres and positions to retrain swallowing (the patient exercises the swallowing muscles for up to an hour while concurrently receiving the VitalStim treatment). · If treatment is properly applied muscle strength increases, cortical reorganization is accelerated, and the effectiveness of exercise therapy also increases. • We clean the skin and place the electrodes; it will be necessary to shave in the case of male patients. • We apply electrostimulation for one hour or according to the tolerance of the patient. 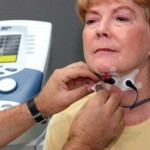 • During stimulation, the patient performs active exercises – assisted and practising of swallowing. • We gradually introduce different solid and liquid foods based on patient tolerance. Neuro-muscular electrical stimulation (NMES) is commonly used to help restore muscle function in other parts of the body, however, treatments with traditional NMES equipment and electrodes are contraindicated for use in the front of the neck to the imminent possibility of causing undesirable responses such as laryngeal spasm or there may be a risk that the stimulation reaches the carotid sinus, causing sinus bradycardia. 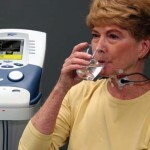 However, the VitalStim® Therapy System is not a traditional form of NMES treatment since the equipment and the electrodes were developed specifically for the safe and effective treatment of dysphagia. Research shows that the combination of electrical stimulation and traditional techniques of treatment is very effective for restoring the swallowing function. Some patients do not respond well to VitalStim® Therapy. This may include patients with significant damage to the lower motor neuron and patients with severely impaired cognition. A certified doctor can give more information about those patients who are candidates for treatment with VitalStim® Therapy. The VitalStim® System must be prescribed by a doctor and can only be administered by a trained VitalStim® Therapy speech therapist. Treatment sessions usually last one hour, although during the beginning of the therapy or when the age or the health conditions of the patient require, this can be decreased, or fractionated therapy can be provided during the day. In many patients, the improvement in the swallowing function starts almost immediately. Patients often see good results from between 6 to 20 treatment sessions. Does it work with all forms of dysphagia? It works with oropharyngeal dysphagia, which is the most common form, and is seen in patients after suffering a stroke, patients with progressive neuromuscular disorders and patients who have survived head and neck cancer, especially after radiotherapy. It also works very well in elderly patients with dysphagia of unknown etiology. · The VitalStim® Therapy System should not be used when the cause of dysphagia is the esophageal origin, or until this condition has been corrected. · When the patient has severe gastroesophageal reflux. · In patients with dementing disorders that present “verbiage”. · When there is a tumour or active infection at the front of the neck. · In patients with uncontrolled seizure disorders. · It must be used with appropriate precautions when the patient has electronic implants (pacemakers, defibrillators, deep brain stimulators). · When the patient has metallic implants in the neck and in the path of the electric current. A certified medical professional from VitalStim® Therapy can provide more information about the indication for this treatment. What are the side effects of VitalStim®? The only side and undesirable effect observed during follow-up in clinical studies has been the occasional appearance of skin irritation as a result of the adhesive used to attach the stimulating electrode in the front of the neck. How is the effectiveness of the VitalStim® Therapy System? Multiple studies indicate that the VitalStim® Therapy System is safe and effective and that the addition of electrotherapy to traditional management of dysphagia significantly improves outcomes and reduces hospital time. Furthermore, the FDA has also shown positive results from treatment in most patients.